This program seeks to prepare and empower young women to be the next generation of change-makers. Utilizing skills from science, technology, engineering and math (STEM) fields, we’ll challenge our brains, get our hands dirty, and use our creativity to envision and engineer new solutions. This program is designed for girls who are interested in STEM and want to gain new skills, learn about STEM jobs, make friends, and make a difference! Do you or someone you know want to be part of the first ever TEENS Project this coming July 6-10th? If so, apply by June 1st! Where: We’ll start and end each day at Port Townsend Marine Science Center. There will be several field trips to other places in Port Townsend (on foot or public transit) throughout the week. We’ll camp at Fort Worden on the night of the 9th. How to apply: Complete the online application. Applications are due June 1st; applicants will be notified by June 8th whether or not they have been accepted. *If fee is prohibitive to someone attending the program, please contact Danae to explore scholarship opportunities. Meet the Project Leader: Hi! I’m Danae and I’ve had a lot of fun dreaming up The TEENS Project with the help of my PTMSC colleagues, friends, and family. I’m currently in my first year of graduate school at The Evergreen State College in Olympia, WA, pursuing a Masters of Environmental Studies degree. From 2012 to 2014, I worked at the PTMSC as an AmeriCorps member. Serving at the Science Center was truly inspirational for me. I worked alongside passionate, intelligent women every day. I was challenged to teach myself new skills-- such as cleaning a seal skull and investigating cause of death, or tinkering with the saltwater plumbing system when the tanks weren’t flowing right-- but I always had a support network there when I needed it. I want to pay it forward and help inspire other young women to dive into the wonderful world of STEM—and help build their support network. 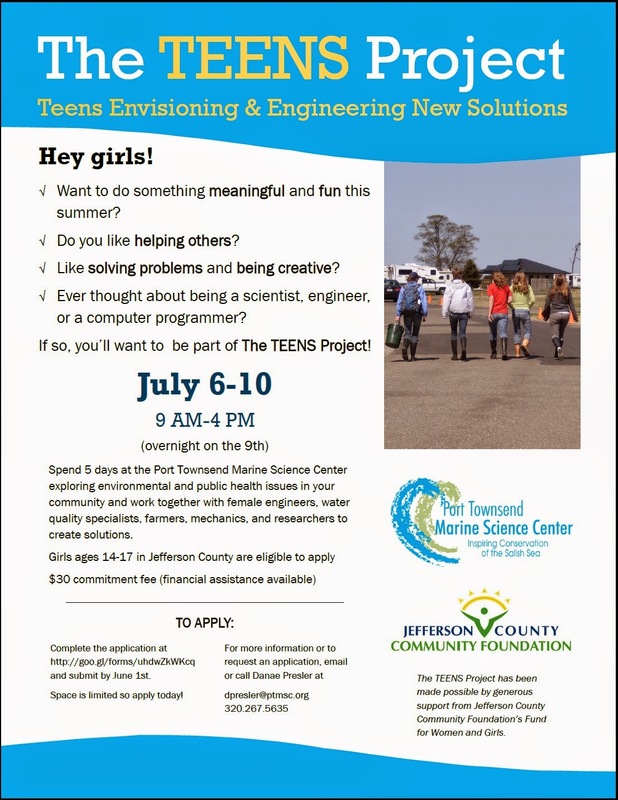 For the last year, I’ve been forming partnerships with incredible women in STEM working right here in Jefferson County to be part of The TEENS Project. I can’t wait to launch the program this summer! The TEENS Project has been made possible by generous support from Jefferson County Community Foundation’s Fund for Women and Girls. Jefferson County Community Foundation (JCCF) is a nonprofit organization dedicated to enriching the quality of life in Jefferson County. JCCF provides flexible ways for donors to engage in improving their community through charitable giving. Community grants are awarded from funds based on the interest of the donor or an open competitive process that addresses the changing needs of the community. For more information about JCCF, visit www.jccfgives.org or call 360-385-1729.